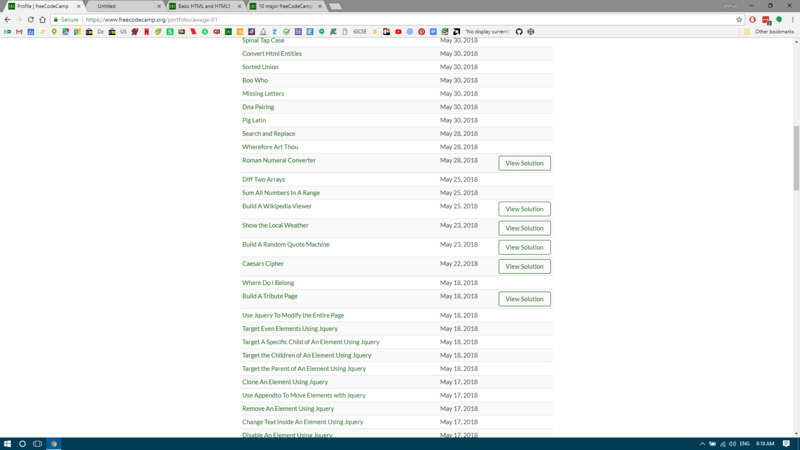 It shows up under Take Home Projects on the curriculum map. Thank you. But is this exercise more appropriate AFTER having done Sass, React, etc now? Because it wasn’t like that before. These projects are now not part of the the requirements for the new certificates (they have been replaced with better defined, more robust, and testable projects). Think of them as in an “extra credit” section rather than a strictly chronological progression. FWIW, they’re going to put links to the legacy projects in a more obvious place in an upcoming UI update. I managed to get my programs back through the download all data button, although it’s a little unreadable. Fortunately, I know JSON, so I should be able to comb through it, and get something useful out of it. 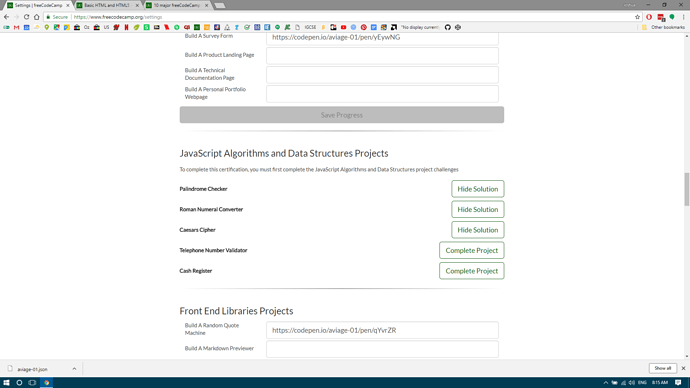 Actually, I might build a web page on CodePen which can process the JSON into something useful! With the show/hide solution buttons, a button can only be pressed if all the buttons above it say ‘show solution’. Why don’t you simply click the code window? You can get to it by hitting [Tab] enough times if you want to. Not super efficient, but doesn’t require using a mouse. Thank you! “Hard refresh” seemed vague and like it could mean different things — cache, factory reset of browser, clearing cookies? So thanks for clarifying. Appreciate it. Not to be too critical of your comment, but why even respond to a question if your answer is going to be “just google it”? Was just looking for a quick answer that could help speed my progress along after spending more than a half hour of troubleshooting my own account (where I still can’t see my old FCC progress), searching for open issues on Github, making sure my experience aligns exactly with the OPs’, and commenting on those issues in hopes that they might be addressed so I can use FCC again. I have precious time to code these days and that 30+ minutes was it for the day. I thought leaving a question for someone to maybe answer for when I can code the next day might help me out, and it did. Sort of. I’m still unable to access my account’s previous progress even after a hard refresh. Shout out to @OGTechnoBoy for answering my question and helping me out. Great work team, I like it. Looking forward to diving in to the new materials. We’re planning to add a TON of hotkeys. We had several of them, though they aren’t yet working on the new platfrom. Like you, I prefer to use hotkeys for everything, and use the mouse as little as necessary. Thanks a lot for a great job! Does this only apply to those who had already completed the original 3 certifications? 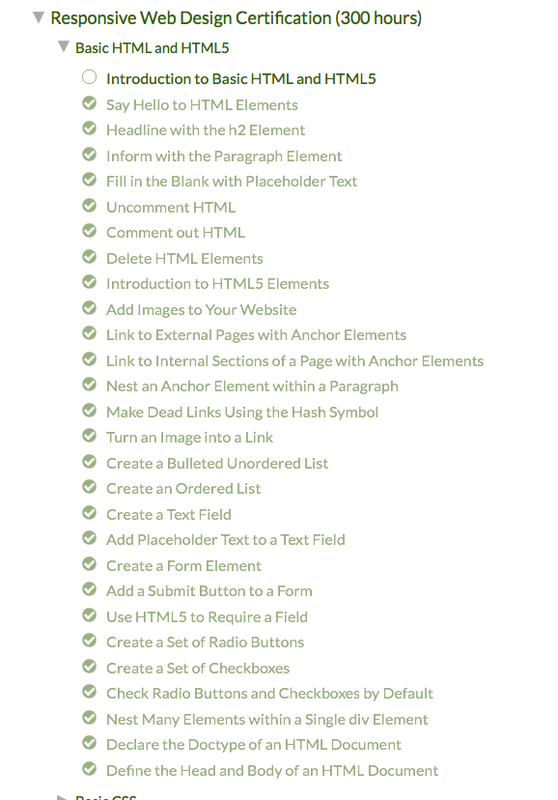 I only ask because I was about halfway through with the Front-End and now I have so much more tutorials to go through and since there are 6 certifications I don’t know where to start. As a beginner I don’t know? Also, I prefer the old title of “Front End Certification” rather than ‘Front End Library Cert’ & ‘Responsive Design Cert.’ ? I don’t mind learning more, but the original title sounded more cohesive. Is there a way we can go to the old format, complete the tutorials/projects and still claim the original “Front End Certification”? You can claim all 9 of them. Go to the Setting page, scroll to the bottom of the page and you can see the legacy certs. Thanks, so much for your reply. 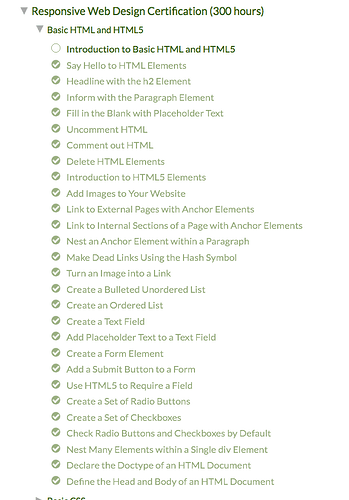 So the Front End Certification is now called “Legacy Front End Projects” and I would have to complete all the projects listed in that section? If so, this is excellent! My goal is to complete this certification before I go on and look at the other certs. Can we work with freecodecamp offline? I sometimes don’t have internet access as I’m alway’s on the road but have tons of waiting time during work hours. Any chance of seeing this happening soon? I know it’s a big ask but it would just be awesome to have that option. Ok, happy coding! Love the new site by the way. Is there a way to access the user stories of the Legacy Projects? Maybe make them visible when the project title is clicked on in Settings? This make me so incredibly happy. Thank you so much for all of the huge effort and love you put into this project. You are certainly revolutionizing education and making it accessible for anyone. And this is being said by a guy in Venezuela. And having the previous drop-down menu for the curriculum is nice, perhaps to avoid clutter what can be done is to only show the current active certification and if the user wishes to view all, they can press the curriculum button or view all button?